Let’s take a few days off from the ponderous ponderings of politics and speak of Christmas. But we cannot entirely separate ourselves from the issues of our time, not even today. Today we are going to talk about immigration and the day Christmas became American. In the process we shall produce documentary evidence that Christmas is, indeed, American. In fact, it is Missourian. Stay with us for a trip through some of Missouri’s Christmas history including times when Christmas around here was much different thanks to a large degree because immigrants. Christmas was not always a day that all business stopped except at convenience stores. There was a time when the legislature met on Christmas although not if it fell on a Sunday. But 150 years ago or so, the legislature started meeting about November 1 and quit into February. In the days long before highways lawmakers pretty much stayed in Jefferson City once they arrived there. Sessions were timed to begin after the harvest and to quit so legislators could get home for planning season the next spring. While Christmas was a significant day it was not a holiday in Missouri until 1895. It was a day of worship for the French, the early Anglo-Saxon settlers of what is now Missouri. At least it was for the French who were worshipful. Henry Marie Brackenridge, Missouri’s first author, recalled his days as a boy in Ste Genevieve sitting in church for an hour awaiting midnight mass. The service featured the largest wax candle the village could afford. No stockings hung by the fire place with care. French children put their shoes near the fire place on Christmas Eve so the Christ Child could stuff them with presents overnight. German-born Gert Goebel, a Franklin County settler in the 1830s, remembered Americans held no Christmas Day church services, gave no presents, and knew nothing about the German custom of having a Christmas tree. While it is always dangerous to claim that something is the first of anything, it could be that the first Christmas tree west of the Msisissippi River was in St. Louis in 1833. The noted plant researcher, George Engelmann and an Illinois friend, Gustave Koerner took a young sassafrass tree with some remaining leaves on it, put it on a “kind of pedestal,” and let firls decorate it with ribbons and pieces of colored paper. Santa Claus took a little time coming to our towns. We do find a reference in an 1843 St. Louis newspaper that the editor hoped all the children had been good and found their stockings filled with gifts from St. Nicholas. Another editor wrote in 1852 of Santa Claus riding his flying chariot over homes, coming down the chimney and leaving gifts for good boys and girls. The start of gift-giving as we know it now came along a decade after we became a state (1821) . A study of early Missouri business ledgers shows no sale of Christmas presents. But in the 1830s we do start to see some small ads for Christmas and New Years presents. And what would Christmas be without food and lots of it? The French baked doughnuts or other pastries and made some semi-distilled rum served to friends who dropped by on Christmas. The Christmas turkey wasn’t that hard to find. Schoolcraft wrote that hunters were sent out to kill wild turkeys for Christmas dinner and an hour later they were back with 14 of them. Schoolcraft convinced the lady of the cabin to make turkey pie with corn meal crust. What else was there in those early Missouri Christmas meals? Venison, salted beef, cured ham, dried fruits and vegetables, calf’s foot jelly, mince pie, and pound cake. Some homes allowed egg nog. One Randolph County resident recalled that as soon as the yule log was lighted, his mother would stand next to a big bowl of egg nog and each member of the household, whites as well as blacks, would file past to get a glass of it which they drank as a toast to her good health. One recipe for egg nog published in the Kansas City Journal of Commerce promised it was good for consumptives and debilitated persons. Christmas oysters were introduced into this part of the county in the late 1830s or early 1840s. A Jefferson City newspaper told readers in 1840 that six barrels of fresh oysters were for sale at a Jefferson City hotel. The yule log had a special significance for slaves in some households. It was customary that slaves did not need to work as long as the log burned. So the slaves tried to pick the greenest and hardest wood they could find so it would burn longer. Things were slow in the St. Louis Criminal Court during the Christmas season of 1855. For several families in the city, the Christmas would be a mournful one. Less than two months earlier the first Pacific Railroad train opening passenger service to the state capital had crashed through the unfinished Gasconade River bridge between Hermann and Jefferson City, killing more than thirty passengers, many of them from St. Louis. On the western border, open conflict between slavery-supporting Missourians and abolitionists who wanted the new Territory of Kansas to come into the union as a free state had broken out, beginning the Missouri-Kansas border war. Five years later, the population of St. Louis had reached 95,000. The Germans and the Irish didn’t like each other. Fighting was common. The rivalry fueled a major riot in 1854 that left ten people dead. The next year, the state legislature passed a riot act that said police could not be held liable if officers killed or wounded any rioters. So 1855 was a year of cultural tension and sadness as Christmas approached. 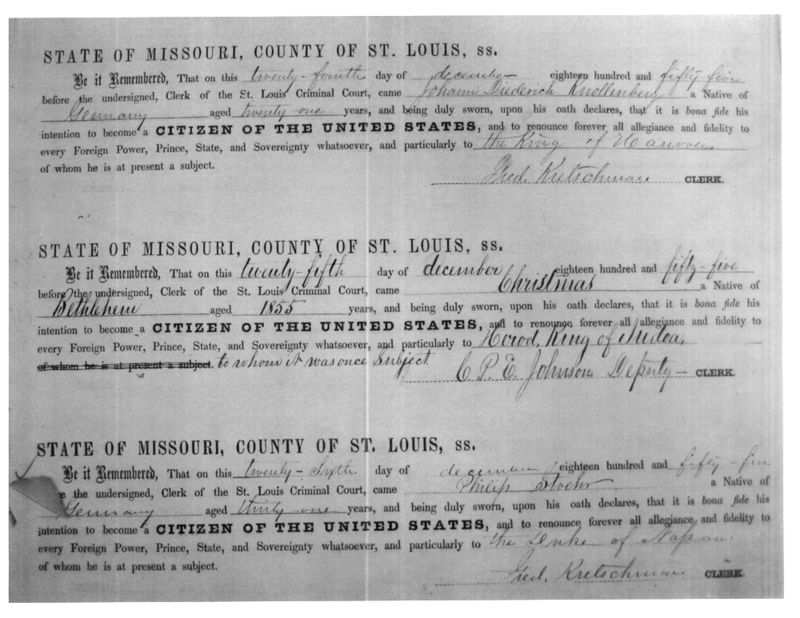 The scope of German immigration is reflected in the documents of the St. Louis Criminal Court which issued citizenship documents. Not long ago, some folks at the state archives microfilming St. Louis court records were working on citizenship documents issued by the court clerks when they came across an interesting entry. On the same page is the profession dated December 26 of 31-year old Phillip Stoehr that he, too, was becoming an American citizen. But it is the entry between these two men’s citizenship declarations that is of particular interest today. It is the certificate dated December 25, 1855 showing that “Christmas, a Native of Bethlehem aged 1855 years, being duly sworn and upon his oath declares, that it is bona fide his intention to become a CITIZEN OF THE UNITED STATES.” And Christmas renounced any allegiance to various potentates and states, “and particularly Herod, King of Judea, “to whom it was once Subject,” as Deputy clerk C. P. E. Johnson wrote on the form. So now you know when Christmas formally became American. The holiday is an amalgam of customs and teachings from numerous cultures. But as of December 25, 1855, Christmas became American. And Missourian. St. Louis probably needed a little of the peace and good will that Christmas represents in 1855. All of us still need that, don’t we? The Missourinet wishes them for you this season.